Since the early 20th century, nearly all of Earth's glaciers have been retreating or melting. Glaciers cover 10 percent of the planet's land area and contain 75 percent of our fresh water. Moreover, the water from melting glaciers accounts for nearly two-thirds of the observed rise in global sea levels. 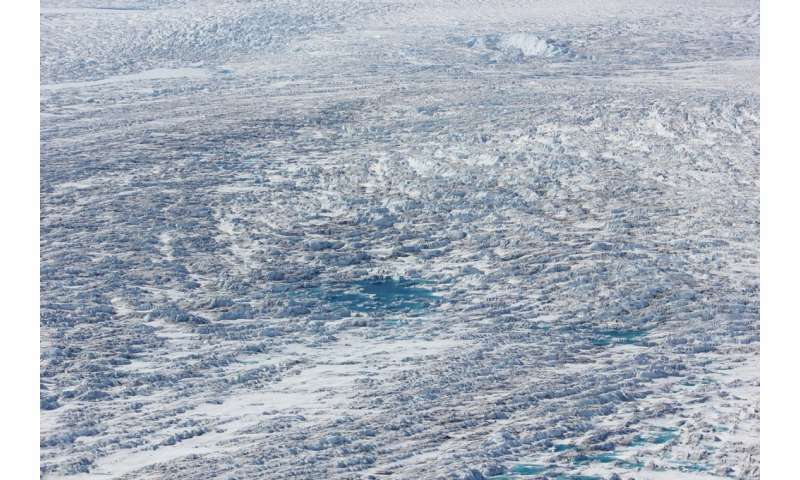 Despite the looming ecological consequences, glacier motion remains poorly understood because of a lack of research on how large ice masses sheer and flow in contact with bedrock. The roughness of bedrock, the temperature of the ice-bed interface and the presence of water-filled cavities all affect friction and influence how the ice will flow. Studying these factors poses unique challenges—remote radar sensing by satellites and aircraft can track glacial movement, but it can't peer through thousands of feet of ice to measure detailed properties of the ice and rock. In a new paper in The Journal of Chemical Physics, theoretical physicist Bo Persson of the Jülich Research Center in Germany describes a new model of ice friction that offers crucial insight into glacier flows. Persson turned to previous studies of rubber surfaces that are either in stationary contact or sliding past each other. For glaciers, he examined factors such as bedrock and ice roughness, and the effect of regelation—melting and freezing caused by local pressure fluctuations. "The pressure fluctuates because of the bedrock surface roughness," he explained. "If you have a big 'bump' on the bedrock, the ice pressure against the bump will be higher on the side where the ice moves against the bump"—thus lowering ice's melting temperature. "The most important contribution of my theory is that it describes accurately the formation of cavities during sliding, and shows that cavitation indeed occurs for sliding speeds typical of flowing glaciers," Persson said. For most thick glaciers—like the polar ice caps—the temperature between ice and the bedrock is close to the melting temperature of ice due to geothermal heating and frictional. As a result, the cavities are almost always filled by pressurized water. The presence of this water at the ice-bedrock interface has two effects, Persson explained: It carries some of the weight of the overlying ice and it further lubricates the bedrock. "Both effects will reduce the ice friction," he said, which causes glaciers to flow faster. "The friction between glacier and the bedrock is of crucial importance for the flow of glaciers and for the prediction of the increase in the sea level due to the melting of the polar ice caps," said Persson. "We ice sheet modelers need to resolve the base of ice sheets in our models better, which requires numerical methods that are not yet common for us," said glaciologist Angelike Humbert of the Alfred Wegener Institute in Bremerhaven, Germany, who works on ice-sheet modeling and the remote sensing of ice sheets and glaciers using satellites. "That's even more tricky when simulations still need to be fast enough to run simulations until the year 2100 or 2300. Bo's work reminds us of the key role played by the roughness of the bedrock, which is very challenging to observe with the required accuracy in airborne radar surveys."